by Carla MARQUANDT. Published in Psittacine Aviculture (26.1-4) in 1992 . Hyacinth macaws (Anodorhynchus hyacinthinus) are difficult to breed in captivity. Behavioral observations are necessary for the aviculturist to provide proper food, shelter and breeding environments. These observations are also useful for understanding similarities and differences among species. They may provide insight for better bird pairing and egg production. In order to learn more about the behavioral patterns of the Hyacinth Macaw, a colony breeding experiment was initiated at ABRC in November 1989. To find if colonizing (housing birds in a communal cage) increases breeding activity. To observe the interaction between adults and juveniles. 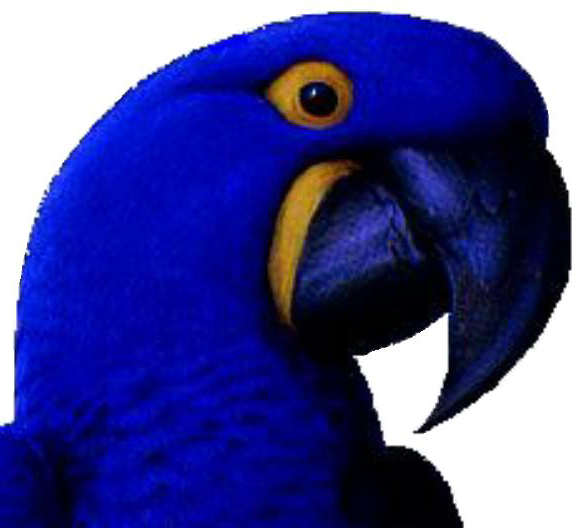 Four pair of wild-caught adult Hyacinth Macaws were selected to establish the colony. One of the females had previously produced eggs and was subsequently re-paired following the death of her mate. Otherwise these birds had not produced in captivity. Unproven pairs were selected in the hope that the colonization process would stimulate breeding, strengthen pair bonds or establish new pairs. Four (2.2) hand-raised, imprinted juvenile Hyacinth Macaws (four years of age and younger) were also introduced into the colony. They were included to see what effect they may have on adult behavior, and to see if they would learn breeding behavior from the wild-caught adults. All twelve birds were permanently identified. The adults were identified by implantation of a uniquely encoded transponder in the left pectoral muscle. For visual identification tail feathers of one pair were cut and certain behavioral tendencies of some individuals were noted. Other pairs of adults were not visually identifiable. Closed bands were left on juveniles. An existing chain link flight (8' x 19' x 72') with a concrete floor was used as the colony cage. Private breeding sites in which pairs that showed breeding behavior could be separated were constructed adjacent to the flight cage. Five individual chain link suspended cages, each measuring 6' x 6' x 12' were extended from the west side of the flight. Chain link tunnels with doors connected the individual cages to the flight. The tunnel doors were designed to be closed for individual breeding pairs. Each individual cage was equipped with a front and rear perch. For nesting, a burned out whiskey barrel with 4-6" of wood shavings was hung horizontally in the back of the cage, 41/2 feet from the cage floor. One end was replaced with plywood with an eight inch entrance hole. A 12" x 12" rear check door was installed to provide access to the box. To provide privacy, Ficus trees (Ficus benjamina) were planted around the north, south and east sides of the flight. Queen palm trees (Syagrus romanzoffianum), 20' tall, were planted on the west side approximately six feet apart to shade the nest barrels. At the north and south ends of the flight 3' PVC feed troughs (6" PVC cut in half horizontally with a 6" cap cut in half and riveted on) were mounted on metal poles six feet from the floor. The macaws were fed large macaw mix, hazel and Brazil nuts, fresh fruits and vegetables and monkey biscuits. Water bowls were placed on the floor in the middle of the flight. Vertical tree trunks were cemented into the floor along the sides of the flight. Perches of different sizes and shapes were mounted on these trunks to supply adequate perching area.. Queen palm logs were placed on the floor to provide a landing area around the water bowls. The Hyacinth Macaws showed flocking behavior in the flight and participated in most activities as a flock. If one pair started to display to its mate, with head bobbing, wings flapPing, small hops and vocalization, another pair would often start to display. Birds would rarely drink alone. When one bird would approach the water bowl, two or three more would often fly down to drink. The flock generally roosted together at one end of the flight. Pairs roosted close together. Queen palm fronds were often placed in the flight to give the birds natural branches for chewing. Socialisation as a flock was observed primarily at these times. Four adults could often be seen perching on the same branch displaying and calling to each other. Palm fruits ((Acrocomia sp) make up a major part of the diet of wild Hyacinth Macaws in the Pantanal region of Brazil. (1) This palm fruit is similar to the queen palm fruit. When available, fruit sprays from the queen palm were offered to the flock by hanging them in the flight. As many as six birds were observed hanging on the fruit sprays eating at one time. In the wild several birds can be seen feeding on the sprays of a single palm tree at the same time. Juveniles learned this style of feeding very quickly. The birds would become so excited about having the palm fruits hung in the flight that many times they would land on the stem and begin eating before it was hung. The adults would normally retreat as a flock when the keeper entered the flight. Juveniles on the other hand would fly toward the keeper and curiously observe any activity. One pair of birds claimed the alpha (dominant) position within days of placement in the cage. The male showed aggressive behavior with the female quick to back him up in any confrontation. It was interesting to observe the alpha pair when new objects were added to the flight. For instance, when a new perch was placed in the flight the alpha pair would immediately fly near the perch. They appeared to be examining it, heads bobbing up and down, side to side at each other, then towards the perch. They vocalized back and forth using a "baby call" for the duration of the investigation. Together they landed on the new perch and displayed. When finished they flew away and the other birds came over to examine and chew on the new perch. If during the initial display, other birds flew to the new perch, they were quickly chased off, and the alpha pair display began again. The alpha pair spent a great deal of time displaying and calling inside cage 5. If other adults approached cage 5, the alpha pair would challenge them and chase them away from the cage. Juvenile birds were allowed to approach and even enter the cage at any time. It was observed on many occasions that the alpha pair copulated, or displayed as if copulating, in the side cage on the back perch with the juveniles watching from the front perch. In general adults birds exhibited no negative response to the juvenile birds, but rather left them alone. When the juvenile birds were introduced they spent the first three days inside cage #1, rarely coming out. Initially they came out for short periods, with the length of time gradually increasing. The adults seemed to tolerate the younger birds as if showing them pair bonding courtship behavior. The four juveniles would line up on one perch and watch the adults in courtship display on the opposite perch. The juveniles were aware of the pecking order and would never interrupt the alpha pair when they were displaying on new perches or around the cage. They could however, skip ranks when a spray of palm fruits was hung in the cage. The alpha pair would feed first, but as soon as they left it was every bird for itself and the juveniles could hold their own. In the spring of 1990, the alpha female was being courted by another male. This bold male would only attempt courtship when the keeper was in the flight. During this time the alpha male would be distracted. As soon as the alpha male noticed what was happening to his female he would quickly fly over and chase the intruding male away. On the evening of April 30, the birds were especially loud. Upon investigation one of the birds was seen being attacked by the others. The bird was quickly removed to the hospital. Emergency therapy was initiated, but he died later that evening due to shock and trauma. Necropsy revealed that the crop was punctured. Bite wounds were present on the breast, accompanied by deep linear scrapes and bruising of the musculature. Bite wounds were also present on the back with a deep puncture wound just above the right shoulder. The second, third and fourth toes on the right foot were severely bitten. What really happened among the birds that evening and why that male was singled out and attacked will never be known. Perhaps the male was courting the alpha female. The alpha male took his revenge, and quickly was helped by the rest of the flock. However, blood was found on the wire indicating that his foot may have been caught, or he perched there after his toes were injured. He may have been attacked by the other birds thinking he was weakened. This fatal attack caused many problems the next day. The alpha pair was placed inside cage 5. The remaining adults were caught, identified by transponder and paired with their original mates and placed in cages # 3 and # 4. Original pairs were maintained since no indication was given that the birds were re-pairing, with the exception of the above described male. The juvenile pairs were left in the flight along with the single adult female. On May 15,1990, a new male was released into the flight (his tail was clipped for identification). He took very little time in showing the other adult birds how tough he was with aggressive displays at the wire doors of the side cages. Once again this adult left the juvenile birds alone. At times it almost seemed that they were ganging up on him by trying to take all the food from the food troughs for themselves. By May 28, the new male had started courting the widowed female. In late August this last pair of adults was caught and placed inside cage # l.
Almost immediately upon placing the three adult pairs in the side breeding cages, their breeding call could be heard more often. Only one pair of the four laid in 1990. In mid July,1990, two eggs were found in cage #4. They were not fertile but it was the first time the pair had laid. It was surprising that the alpha pair did not lay, despite their aggression, displaying and copulation. In late November 1990, during the traditional "non-breeding" season for macaws, the adults were again released into the flight cage· This time the tails were cut so each adult was visually distinct. Fights broke out immediately between the alpha pair (from cage 5) and the new pair (from cage 1) mainly with the new male. The birds were caught again to avoid loss of another bird and put back in the side cages. Only the adult pair from cage 1 was left out in the flight with the juveniles, because they were a relatively new pair. The pairs in cages 3 and 5 were returned to the main hyacinth breeding aviary. Cage 4 contains the only remaining pair in the side breeding cages. The adult pair and four juvenile birds still remain in the cage. Since the failure of this experiment in colony breeding Hyacinth Macaws, the flight will be used for socialization and pair formation for juvenile birds. When chicks are ready to be released from the nursery, they will be released into the flight cage. Perhaps the new juveniles will learn normal macaw behavior from the older birds.